Humans, by nature, walk through life with a compulsion to leave their mark on the world. It’s inherent in our makeup, whether one is shooting for a Nobel Prize as a result of something Big, or whether it’s the creation of a child to carry on one’s genes, or the seeking-out of fame. Sometimes, though, the smaller marks can have just as big an impact…a smile to a stranger, a dollar to the dude on the corner, OR a doodle on a wall. I’m talking about street art, and graffiti. 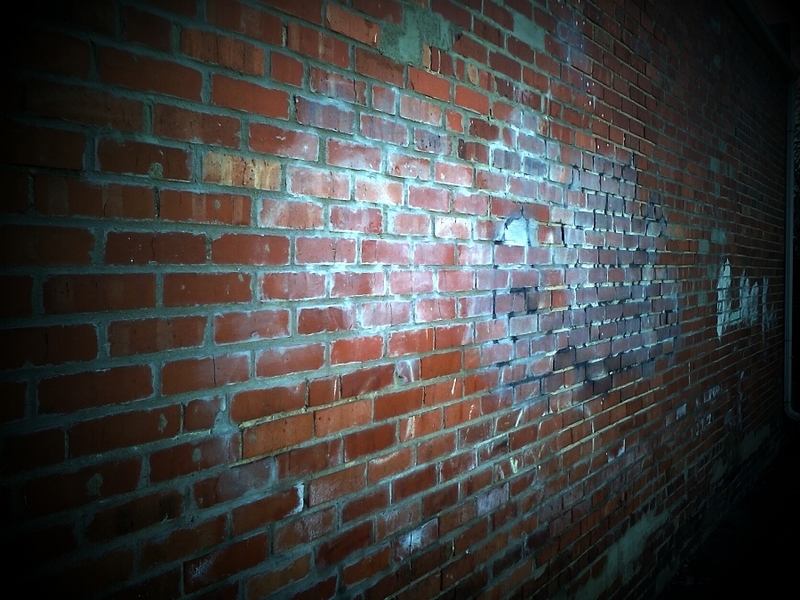 Those words or images or things one sees all over the place, walking through the city, telltale signs that someone has passed by with that desire to leave their mark on a wall or a treetrunk or a dumpster or a sign. Artists like Banksy, for example, or Swoon, have definitely left their mark, in what I think is a most fantastic and inspiring way. But. This still leaves things up to a broad interpretation. Is it good, or bad? The fact that they use the word “deface” gives one the impression that it is, generally, bad. But. There has been much debate over the art vs. graffiti topic. Is graffiti art? Is street art graffiti? Are they one and the same? All I can do is offer my own opinion, here, and share some things I’ve spotted just in the last couple of days of wandering. I’ve come to conclude that, for myself, the line is pretty vividly drawn, and it all boils down to How It Makes Me Feel When I See It. Example 1: THIS IS NOT ART. This is tagging. I loathe tagging. Not only is it aesthetically unpleasant, it has no meaning to me. It does contain meaning to others but it is the kind of meaning that I bear little respect for. When I see this sort of thing, I think of Gang Weenies peeing on their territory. I find it to be quintessentially lame and a tragic eyesore. However, I have also seen works done by “Graffiti Artists” who take that type of style, and turn it into beautiful imagery. THAT is different, and requires creativity and skill. Example 2: This one is pushing it. It’s a combination of imagery and content, done to make a statement. It’s not my style but, barring that, it’s getting closer to falling into the Art category. Close, but not quite. RAVEN! I HEART YOU! Touching. 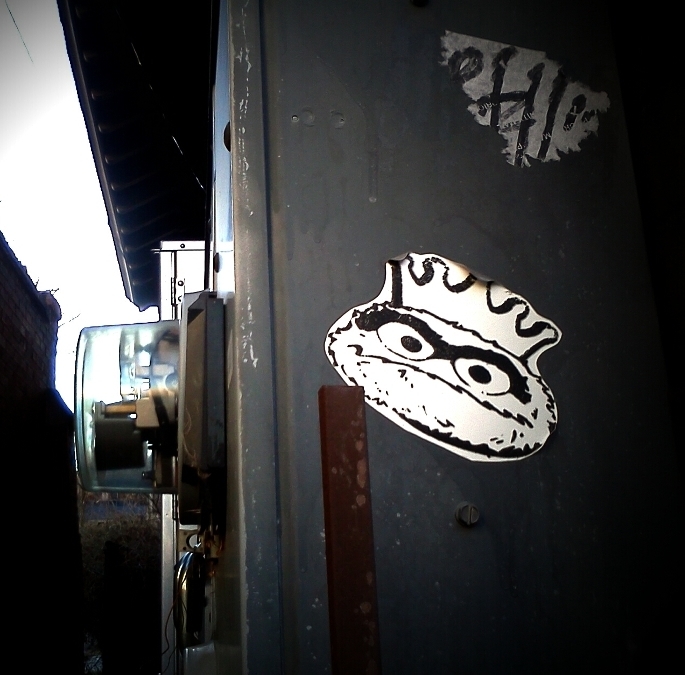 King Oscar, first sighting, out in my alley. King Oscar, second sighting, in my building’s parking lot. Never mind the shadow of the big scary robot in the background. Rar. Example 4: These have been cropping up just this week. 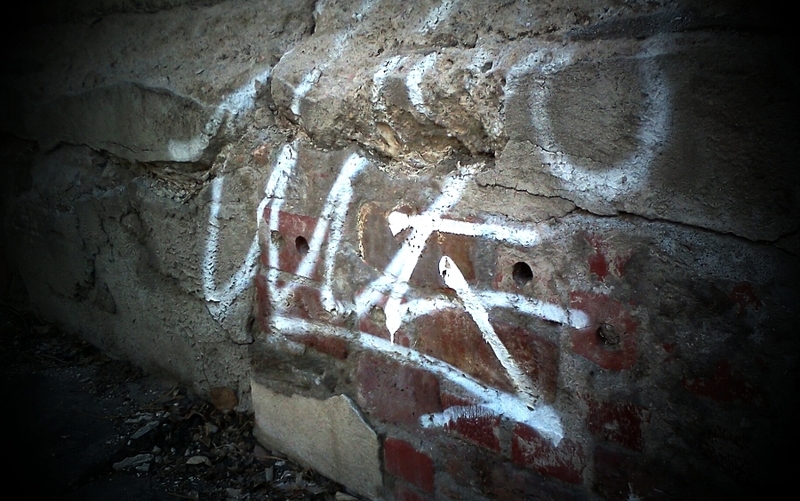 On Tuesday, I took my normal cut-up-the-alley route for my last block to work, and saw the first piece. It made me smile, big. Then, yesterday, the second one had appeared. These are cropping up in the little insets along the wall. There are a LOT of insets. I keep hoping that they all end up adorned like these. Now, in the mornings, I find myself looking forward to “checking the alley,” to see if anything new has appeared. Thus, I deem it Art. 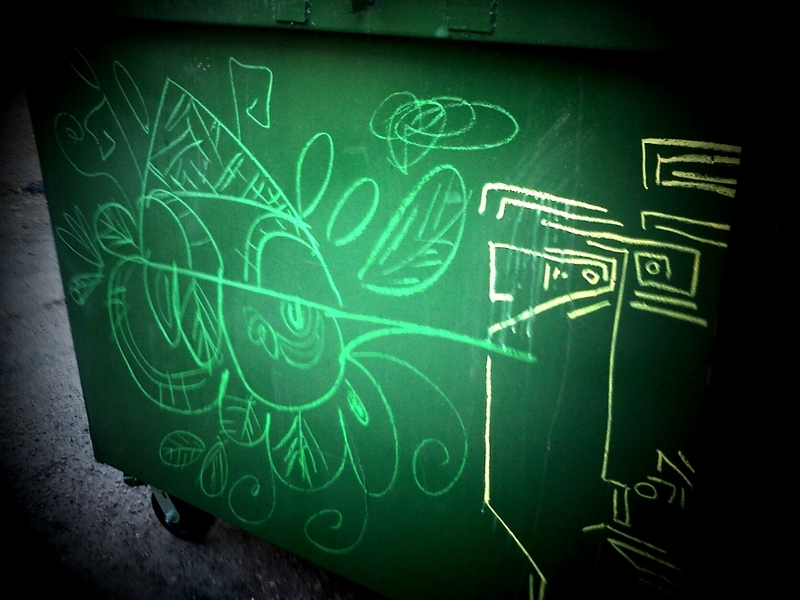 Example 5: The vast majority of markings that one spots on a dumpster tend to fall into the Tagging category. Every once in a while, that is not the case. I happened to see this, in my alley, because I randomly turned back to look behind me at the right time, in the right place. Otherwise, I would have missed it. From a technical perspective, it’s not *really* anything to swoon over. But it’s organic and something that I was not expecting to see, so it made me happy. 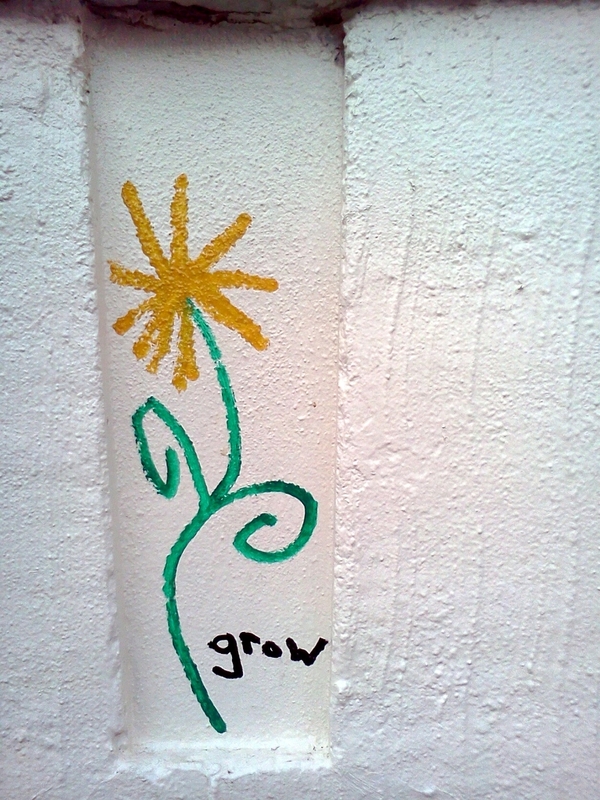 More people should beautify the receptacles that hold our gomi. It makes the world a little prettier, in some way. That was just a small sample of what I see, walking around down here. In this past week, I’ve become more aware of it, and now I travel on foot and find myself staring all around me, on some Great Big Search for Everything. It’s nice. It makes the world a little more interesting. Some people don’t think so, though, and when they spot markings on their terrain, whether it is graffiti OR art, they wash it off, paint over it, or otherwise blot it out. 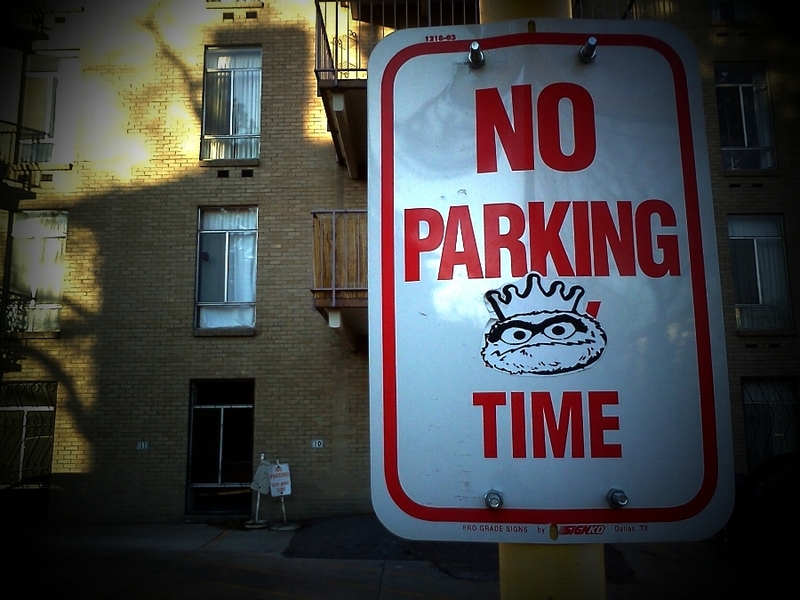 For the most part, the first images to be eradicated are the lame pee-marking tags. I’m fairly certain, by the basic shape of the cover-up above that this is what that was. Rock on. 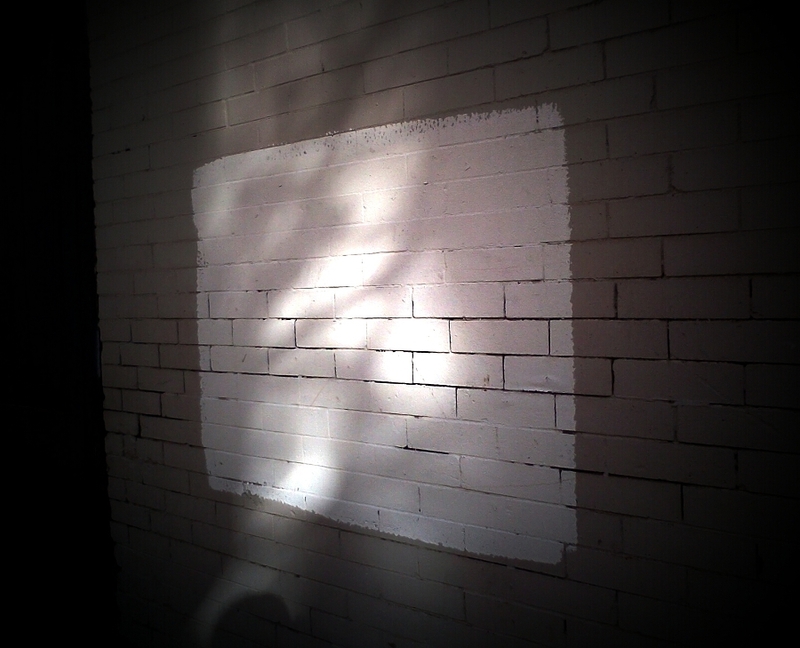 Inevitably, though, the fun arty stuff gets Gray Ghosted too. Some spots sooner than others, certainly, but all of it very nearly always goes away. 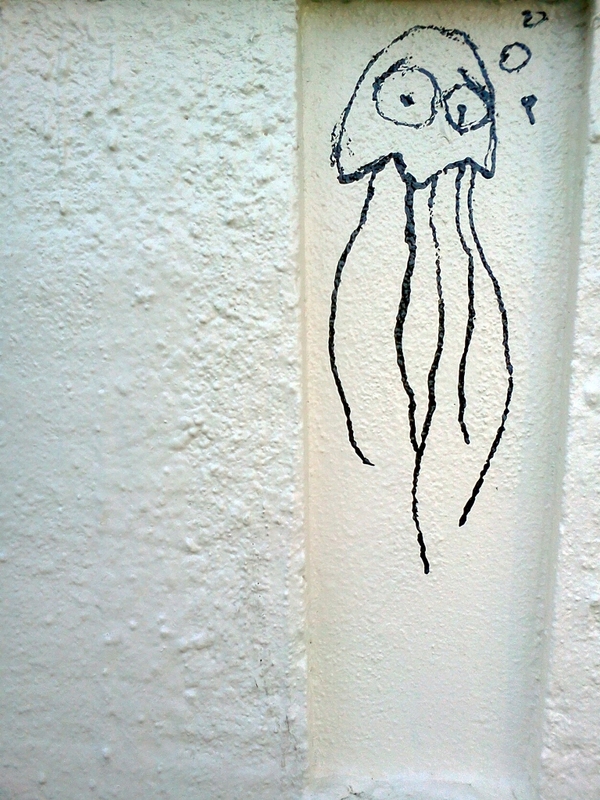 In my alley, on a brick-red wall right behind our building, there was once a very wise, stencil-spray-painted yellow owl. I never got a shot of him, but he was a grin-inducer every time I left the apartment. He was there for a VERY long time, in the grand scheme of things…I would estimate about 3 months. Then, one morning, he was gone. Art, quite often, is very transitory indeed. Statements don’t always have to be made in paint or sharpie, however. Beauty comes in very many forms. I love the way you see the world, the way you write about it, and the way you share it. Keep posting, smiles abound, and more of those is always a good thing. Thank you for such an introspective and fascinating adventure this afternoon. P.S. That last image makes me think there are a lot of people out there in need of good things and honest in admitting it, as most of the offerings have been taken. Also, it makes me glad that there are folks out there willing to give it. 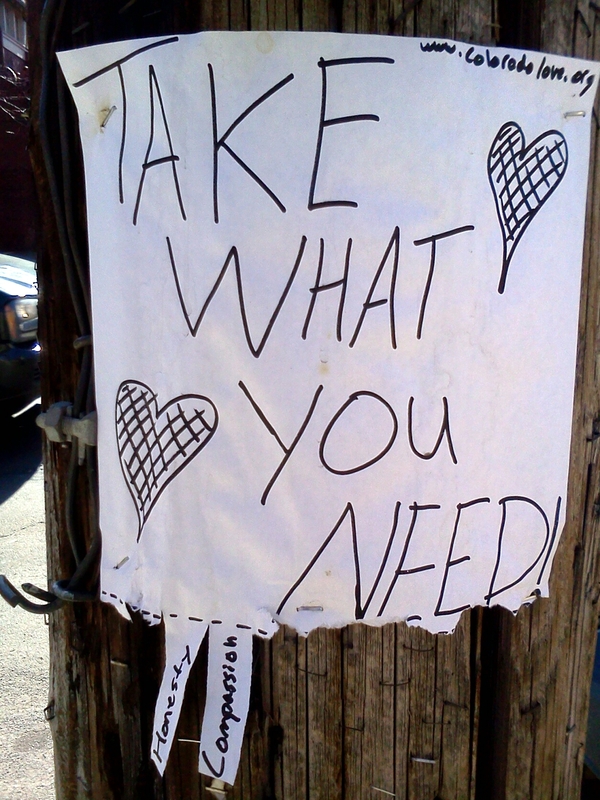 Somewhere, Out There, there are a few people touching that scrap of paper in their pocket, holding on to the goodness that someone else gave without asking anything in return.